Learning how to fill your cake layers is an important step in learning how to cake decorate. 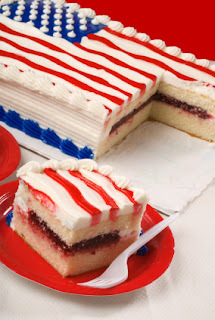 The most common way to fill cake layers is with icing or frosting. This method is used when stacking two or more layers of the same size. The icing between the layers helps secure the layers in place. It also adds more flavor to your desserts. An alternative to using frosting or icing is using flavored filling between layers. This is a good way to blend flavors in and can easily make a gourmet flavored dessert. We'll teach you here how to use frosting to layer. Using a metal spatula, place a good sized glop of icing on the top of your first layer. Spread the icing over the top, being careful not to lift your spatula as you go. This will help not to create crumbs. Use a simple back and forth motion to spread the icing until the top is covered. Get the icing as even as you can. 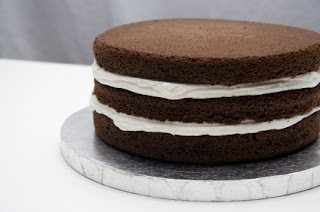 You want the icing layer to be about 1/4" thick. If the icing goes over the sides a little, it's fine. It will be smoothed out later when you frost the whole thing. Fillings can be made from scratch or purchased pre-made. Polaner All Fruit is a wonderful filling to use to fill a cake. It also comes in a variety of flavors. Place your first layer on the board. Drop your coupler into your pastry bag. We are going to use the pastry bag and coupler without a pastry tip to make a "dam" for the filling. Fill your icing bag with frosting. Now, we are going to make a "dam" for the filling. This will help keep the filling from oozing out the sides. Using your pastry bag with coupler only or a large writing tip, squeeze a ring of icing around the outer edge of your layer. Just do this one time around the edge. Next, we are going to add the filling. You want your filling to be no more than 1/4" thick. Place the filling in the center and spread it outwards towards your "dam". Make sure you spread it evenly. Again, you only want it about 1/4" thick. Any thicker and the filling will most likely squish out the sides. You are now ready to place your other layer on top, ice, and decorate. Now, it's time to stack the next layer. 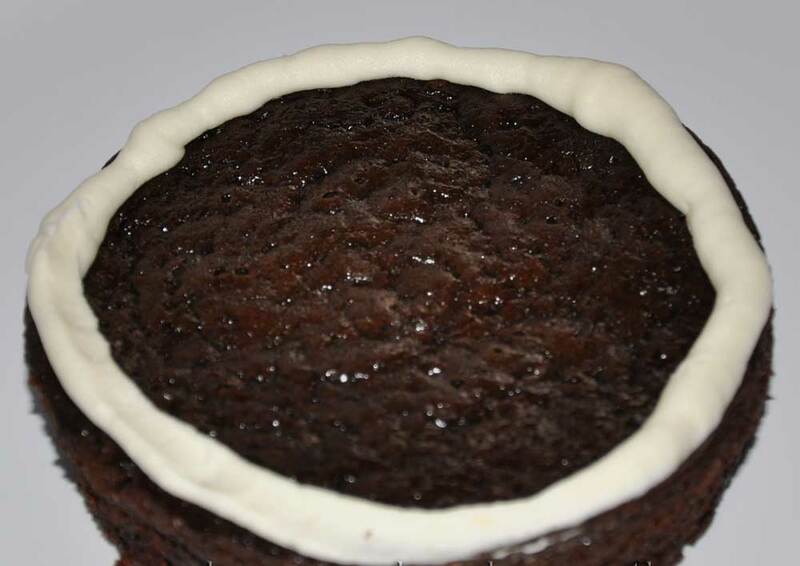 ~It is important not to skip this step or your filling will ooze out the sides while you are trying to frost the sides. Now on to some decorating ideas!